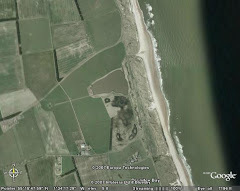 Druridge Diary: Seawatching - a great hobby? I've squeezed two short sea-watches in after work over the last two evenings. Birds were few and far-between on both. I saw none of the 'big' shearwaters that the those without proper jobs have this week, not even a sooty. I did manage a fully-spooned pom tonight, about 2/3 of the way out but in good light. That light deteriorated rapidly at 1930 and I packed in by 1950, just after a single bonxie went north. On my way down from the dunes, there was mega-panic among the hirrundines as a juvenile hobby went north-west amongst them, just over the bushes then the big pool.